Sarge’s bosses have told him that they want to retire him at the end of the month. He is not in support of this at all as he is still fit and desperate to work because he has a family to support including a 23 year old son in school. His pleas to keep his job fall on deaf ears and his bosses will not recant their decision. In a fit of desperation Sarge resorts to extreme measures to ensure that his family are provided for, and he is willing to lose his life in the process. 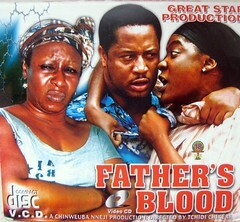 Ifeanyi is cast well as the man who is driven to an out of character act by desperation. The torment is written all over his face through his expression. He interpreted the role very well. Forced retirement is a real issue that people of retirement age have to deal with every day the world lover. They are made to feel useless and hopeless even if they are able bodied and fit to work as we can see in this movie. Having no job with a family to support knocks Sarge’s pride as a man. On the other hand the role of the Chief was minor but majorly butchered. Chief Chief! What can I say – this guy’s acting is more that horrible. Maybe if I say it in French it will lessen the pain I felt when watching him. Il est très horrible!!! His name is John Mgbere and I surely hope not to see him again unless he is not talking. If he is somebody’s friend or relative… A beg was it necessary for him to have a speaking role? He then directs her to present the money to him in 2 years time when he is 25. In this we see a father’s love for his son and desire to see him son succeed where he did not. He is even willing to give up his life to ensure that his son enjoys a better quality of life. He knows that his boss will come for his family if he simply runs away so he makes sure that he alerts them to where he is by shooting his rifle, so that they will kill him and in turn leave his family alone. Why are we shown Salome, Sarge’s wife taking money out of the gold case and hiding it under the bed? I thought she was doing that to then get rid of the suitcase but then fast-forward to two years later when she is presenting Matthew with the money and we see all the money neatly stacked back in the gold case. Why show her taking it out of the case? Why not have her hide the whole case underneath the bed? That made no sense to me. Matthew is told to use the money wisely but what does the stupid boy go and do? He goes to buy a car to impress a girl that he was hawking goods on the roadside with, all because she says she will sleep with him if he has a car! He comes by where she sells her new goods with his new car and on top of that he is decked out in sunglasses and some brand spanking new attire. I thought this was a bit too much of a transformation in the one day. So because he buys a car he must go on a shopping trip too? Matthew’s change in character I felt was too sudden. You have bought a car and some new clothes and all of a sudden you are talking with a posh-ish accent, it felt a little unbelievable to me. On the contrary when he decks out Olivia in her new clothes she looks different but still retains the local razzness that she had about her. Matthew squanders his money on fast living and after his car is wrecked he really has nothing at all to show for it. His mother finds out and is distraught that her husband has died for nothing. Olivia almost gets herself killed by Matthew after he sees her talking to a man in the hotel where she is staying, and finds himself in prison because of this. We see how his father’s ill gotten gains have only brought his misery, but should the sins of the father be revisited upon the son? We see how the pressure of trying to live up to his parent’s expectations and the guilt on his head about not making the most of his father’s sacrifice leads Matthew to using alcohol and sometimes weed as a coping mechanism. There is a scene in part 2 which is hilarious. Olivia is now born again and trying to get Matthew to straighten out his life and marry her but despite the more modest dress you can still see the thug in her. She rolls up to his house determined to change his life by force. When he tries to escape her she grabs him and wraps her legs around him to the point where her asks her, “Is it by force to marry?” to which she exclaims, “yes!”Another hilarious scene involving Mercy Johnson is when she sees him on the street with one of his girls. She beats her up in the middle of the street and then runs back to Matthews house ready to descend on him should he come back. She then sees him with his alcohol and chases him until she wrestles the containers from him! I liked this movie. I would recommend it. The main characters played their roles well and complimented each other. The use of the slow motion and sound effects to go along with it at the end of the movie were very nicely done and added to the dramatics of the whole scene. My only criticisms would be the sudden change in Mike’s accent. Sound also needed some improvement. Many times when the scene would change there would be a block in sound which was very noticeable and it happened more than one. THUMBS UP! NB: At the end of Part 1 there is an epilogue despite the part 2 Tchidi why? I want to know. Is this in case people only buy part 1 or what? Someone please tell me! I believe this movie is 2009 but then in one scene they have Mike singing Sisquo’s unleash the dragon so who really knows if this is repackaged or not? i'm even likin dis review nolly…will def. try n watch dis…cheers!!! I would say that it is worth watching! Ah that explains it then! It was a nice movie but as is the case with Tchidi Chikere, he makes great movies alot of the time but not everyone that is involved in a movie needs to be in front of the camera! i would advice you to quit acting for ever! you can maybe try ur hand at omethign elese where you wouldnt need to speak, like mining tin. I am sorry I do not believe you for one second. It is clear you are in cahoots with, or even are John because you are pimping out the same site that he was. You must have thought you were dealing with an idiot to even come here and post this!!! LMAOOOOOOO! How would you even know what film to click when none of the films on that site are named? The site is a mess… A beg! Tilii you have spoken very well. Correct babe… Nothin do you… They can keep hollering hatersim and jealousy all they want. It is not lies we are telling and so we shall keep forging ahead helping the masses to steer clear of trash that is being put out and at the same time promoting and bigging up those works that deserve it! I believe people bought it from the 30 days website. you should be able to google it. I have never seen it being sold anywhere else. Beautiful but tragic movie. I was really impressed by the story and that the script writer actually had the guts to touch such a sensitive issue. I also thought it was good that they didn't use the alcoholism aspect in a comical way, which is normally the case (just think of klint da drunk or some nkem owoh movies etc..). Nonetheless the funny scenes for example when Mercy Johnson was chasing him down the road, were totally hilarious and really had me cracking up. The ending was tragic, but I would say very realistic because it symbolised so much especially when Patience said continuously "you are not my son", because that is how addictions changes people..they become total strangers to their loved ones. All in all a good story and good execution (with lil' flaws of course) and a must watch. Kudos. It was handled sensitively but still had its comic moments. Yes it is true… addictions can turn people into strangers and the stranger that Mattew came was one totally unrecognisable to his mother. Ill gotten wealth always brings misery!! he movie was great! Mercy, Mike, Patience and Ifeanyi played their parts very, very well. The majority of the acting was on point. I thought the storyline was realistic – as well as the ending – and Mercy Johnson's latter points were absolutely hilarious. Gwon Mercy. Get yo man! really entertaining.. just finished p. 1… unpredictable.. I enjoyed.. M. Johnson was good in it… lemme go see P. 2 hope it isn't tiresome..
Naaaa PArt 2 wasn't that bad. It did get a little ridiculous but I found it funny and had a very strong message at the same time! Dis movie was very nice.I think Tchidi deserves an award 4 his contribution to nollywood.Most of his movies from back then to now are very good.He's very creative and also makes even a simple story entertaining(world's apart).Mike,Mercy and Patience as usual gave excellent performances in dis one too.Congrats Tchidi. Yes his movies are more HIT than MISS. Yah MJ is baaaad like so bad real bad Michael Jackson LOL. She rarely disappoints me! I've just watched it….It was a very touching story and a good material for debate. Tchidi Tchikere is very good. This movie deserve an award…. I found the aunt of Olivia very funny. She was a bit overacting but it was funny. You did not mention her. There was a couple living in the same coumpound with Salome who was strange. The woman looked more like the daughter of her supposed husband…. It was a whole ago so I don't know why I didn't mention the aunt. I really liked this movie. OMG… This movie is AWARD winning. The writers did quite well by keeping their audience on edge of their seats with excitement, enthusiasm, drama and stirring emotions. Although there were some mishaps from reality in a scene when the son, who is suppose to be a drunkard, runs like a marathon runner; this movie still sits at the TOP of the totem pole in its excellence. Awesome WORK!!! Special Nods of grandeur goes to Patience Ozokwor for her portrayal of an overwhelmed-mother.